A new board game with a quirky ‘Scottish heritage’ has been launched in time for Christmas to appeal to people young and old who enjoy combining strategy with cunning. Stramash is a new and improved version of the timeless classic chase game, but uses playing cards instead of dice, and interlocking wooden board pieces called ‘Mashies’ which can be adjusted depending on the number of players, ensuring maximum interaction. Stramash is played with coloured marbles called ‘Laddies’, and playing cards instead of dice, so players must depend on their strategic skills and not simply luck to win the game by sending their frustrated opponents back to their starting points. The word ‘stramash’ has its origins in Scotland and has come to mean a ‘disorderly gathering’ or ‘ruckus’. It was most famously used by sports broadcaster Arthur Montford when describing a goalmouth rumpus in the 1960s. But some believe the name pre-dates this, back into the mists of Scottish history, claiming the game has been played by Scots for centuries, even dating back to the reign of King David II in 1357. Just how true these stories are is very much open to debate, however, East Lothian-based games enthusiast Tony Mitchell, who claims to have rediscovered Stramash believes that if they’re not true then they should be! Believe that if you will - but beware the ‘Bonnie Fechter’! 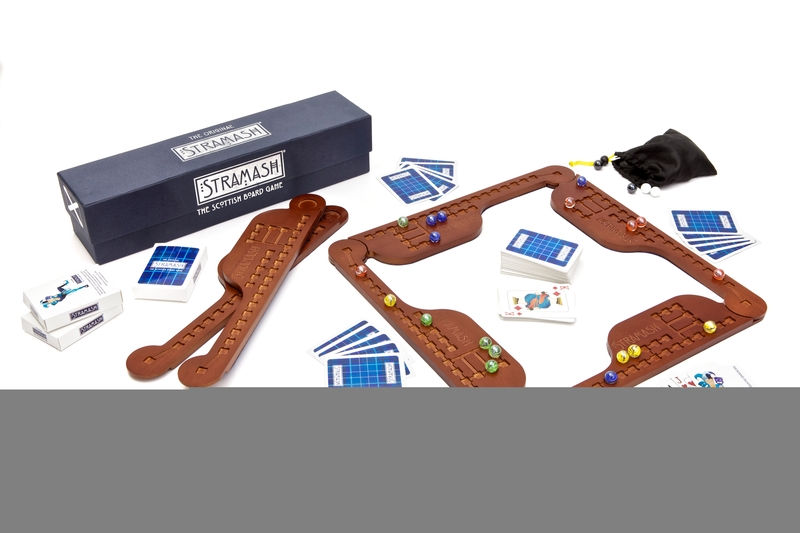 Stramash can be played by 2 – 6 players and is suitable for ages eight upwards. Available online at £34.95 plus post and packaging. •	Rob Roy MacGregor rejected the normal glass marbles when playing Stramash, and instead used discoloured musket balls which he said were “The Dukes’ Balls”, gouged from the wounds he received at the hands of the Dukes of Atholl and Montrose while on the run on Rannoch Moor. •	In the 1800s, Scottish regiments were not allowed, according to King’s Regulations, to carry “items of entertainment” in their packs. However, many soldiers kept their dirk down one sock and their Stramash ’Mashie’ (board piece) down the other. Many officers turned a blind eye to this for the sake of morale. •	In 1759, Benjamin Franklin visited Edinburgh, drawn by the hotbed of genius at that time. He was introduced to the delights of Stramash by David Hume who brought him to a game at Allan Ramsay’s house. •	An anonymous research graduate was working in the National Library and found some references to Stramash in Sir Walter Scott's draft notes for "Waverley". According to these documentary notes the source he was using was the weekly Edinburgh paper "The Brig' o' Dean Blether*". (* "The Brig O' Dean Blether" was literally a weekly newspaper as it would appear to have only been published for one week in May 1807). At the end of 2008, a cache of documents came to light in strange and mysterious circumstances in Edinburgh. This strange collection of documents purported to be from a wide variety of sources, the earliest from around 1707. Some looked genuinely old and some more modern. Some were scraps, torn from letters and manuscripts. Some were printed material of greater length. The only things they had in common was their subject matter, a board game called Stramash and they all seemed to have been written in Scotland. As intriguing and downright unlikely as many of these stories may seem, the game itself is described as a highly entertaining way to spend quality time with friends and family. Stramash has now been re-designed and re-invented, while retaining its mysterious Scottish heritage. The point of the game is to become the Muckle Stoater by being the first player to move your five Laddies (markers/marbles) round the board from your Dock (start) to your Castle (finish. This press release was distributed by ResponseSource Press Release Wire on behalf of Masterson Media in the following categories: Men's Interest, Leisure & Hobbies, Home & Garden, for more information visit https://pressreleasewire.responsesource.com/about.